Touring cyclists love a good packing list. You can spend days writing and amending your list alternating between the minimalist ultralight approach, cutting down weight in every conceivable way, even chopping off that toothbrush handle or you can just fill every available space in your panniers because you never know when that extra jacket may come in handy. 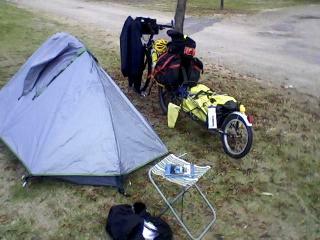 Essentially, Cycle Touring is the art of compromise in action. A balancing act between what you think you want and what you actually need. Not unlike life in general really. Everyone has a different approach, what works for them. On my first couple of solo tours I have hauled a BOB trailer with 30 kilograms of gear, working on the principal that it was “better to pack it and not need it, than need it and not pack it”. Recently, I have left BOB at home opting instead for rear panniers and a handlebar bag with anything extra carried over the rear rack, and that’s worked fine for me. Apart from the bike itself: Which bike to take? That’s a whole other story depending on the destination, road condition and amount of time I have. I could tie myself up in knots trying to get my total gear down to some imagined magical goal weight; such as under 10 kilos. My solution is to drop a few kilos of my own body weight and be rather ruthless regarding what I need to take. The rule of thumb is, if you haven’t used it in the first week on tour “Give it away or post it home”. As most of my riding will be on made roads in daylight hours, I will be taking my steel framed Surly. Strong enough to ride true when fully loaded, but fast enough to cover 150 kilometres a day in comfort. 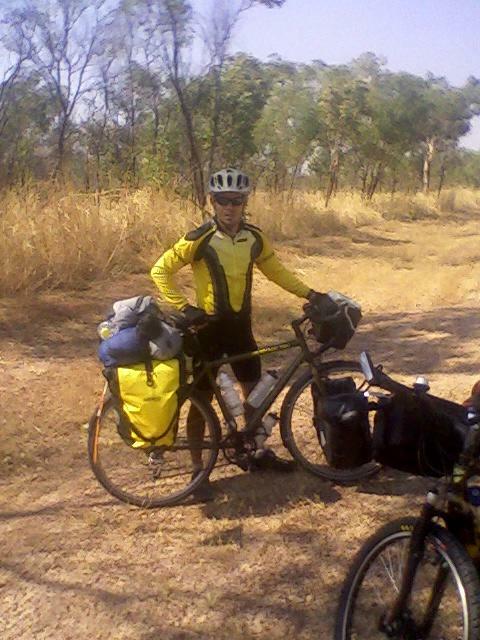 Of course I could make a case for taking a heavier bike that I could take off the bitumen and along the Gibb River Road, but I can still only take one bike and only ride one bike at a time. • Mont -3 down sleeping bag (350gms) hasn’t failed me yet! • Sleeping mattress THERMAREST NEOAIR XTHERM (REGULAR) (200gms) very warm! • Wallet, credit cards etc. • 6 litre dromedary camel back bladder to carry extra water in the more remote areas. • Extra, nuts, bolts, cable ties, tape, etc. The iPhone can be used as a portable hot spot for the iPad as well as carry a number of Apps that I will find useful, such as bike repair, night sky and plant and animal identification. In the coming weeks I will pack, unpack and repack my bike and take a couple of test runs getting the feel and accessibility of items on the bike and how and where they should be packed. During this process there will be some additions and deletions however I expect that I will be carrying between 12 to 15 kilos of gear all up. To compensate for this additional weight I have shed about 5 kilos of my own body weight. Hopefully I can get that mythical balancing act right. I have listed a few good bike touring websites and “backpacking light” a great Melbourne camping shop where you can indulge your lightweight camping fantasies!